Savor the flavor of sweet summer cherries all year long! 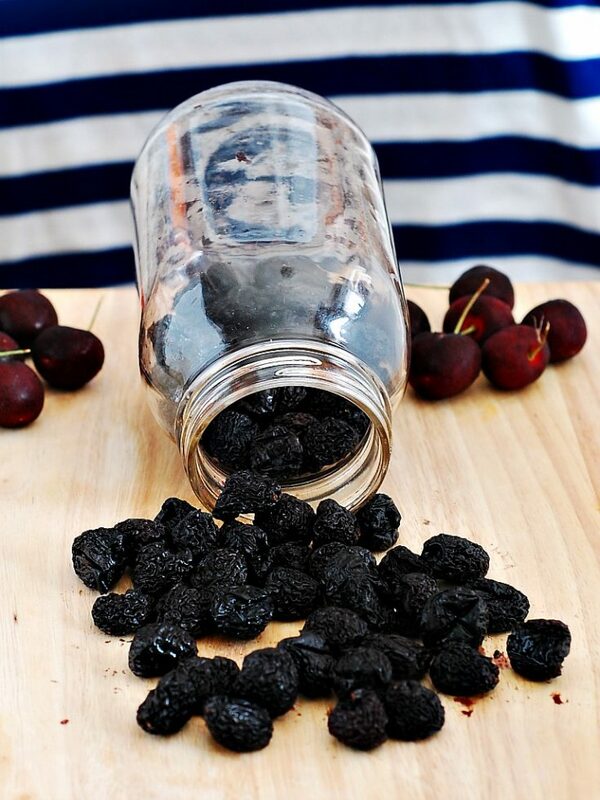 Make dried cherries in your oven, then keep them in an airtight container for a taste of summer, even in the winter! There are so many reasons that summer is my favorite season: warm weather, long days full of sunshine, swimming, barbecues, flip flops, and abundant fresh produce. Sadly, summer doesn’t last forever, at least not in Pennsylvania. The weather will begin to cool down, the days will get shorter … then things will get downright miserable. NOT looking forward to winter, can you tell? Sure, there are some fruits and veggies that you can buy “out of season,” but they don’t always have the same flavor as in-season produce, and they’re also usually more expensive. So today’s #SundaySupper is all about saving that peak flavor. I actually came across this recipe earlier in the summer. Whole Foods had their annual cherry fest, selling cherries for $2.99 a pound. Cherries normally sell for about $6.99 a pound, so this was definitely a steal! I came home with 12 pounds of cherries! Between Dave, Liam and I, we polished off half of those cherries in about a week! I sent another two pounds to daycare with Liam for Snack Share Wednesday. I used another two pounds for other recipes. I was left with about a pound and a half of cherries that were getting precariously close to the end of their shelf life. Then someone told me I could dry them in my oven! If you want to try it on your own, you’ll need to choose a day that you’ll be home all day. Oven-drying has to be done “low and slow,” so it takes a while. But you’ll be left with dried fruit just like you buy in pouches at the grocery store that will keep very well in an airtight container. Grab a handful whenever you need a quick taste of summer! 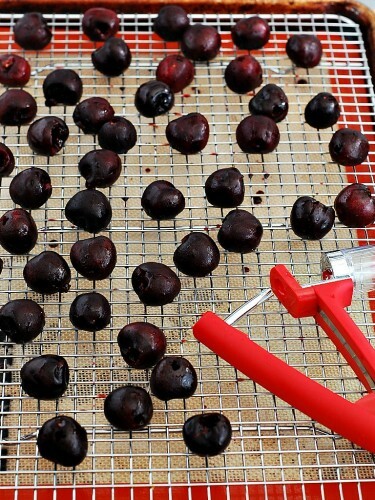 If you don't have an oven-safe wire cooling rack, you can dry the cherries directly on the silicone baking mat or parchment paper, but the cherries will need an additional two hours in the oven. Preheat oven to 200 degrees. Line a baking sheet with a silicone baking mat or parchment paper, then place an oven-safe wire cooling rack over top. Remove the pits and stems from the cherries, and space them evenly on the wire rack. Place in the oven for six hours. Remove and allow to cool completely on the wire rack. Transfer for an airtight container to store. Join the #SundaySupper conversation on Twitter on Sunday! We tweet throughout the day and share recipes from all over the world. Our weekly chat starts at 7 p.m. ET. Follow the #SundaySupper hashtag and remember to include it in your tweets to join in the chat. To get more great Sunday Supper Recipes, visit our website or check out our Pinterest board. Would you like to join the Sunday Supper Movement? It’s easy. You can sign up by clicking here: Sunday Supper Movement. Cherries are my absolute favorite summer fruit, Coleen. Thanks for sharing this easy way to save their sweet goodness! I love cherries so much and this year they have been incredible. I am buying some and drying them now thanks to you. These look like a delightful addition to walnuts for a snack, although I would need to get a cherry pitting tool if I wanted to make them! You’ve just made a homemade version of my favorite dried fruit! I’m sure I’d eat half of these before stashing the rest in my pantry! Yours look terrific! Love this idea! Pinning it now. Also, I have the same cherry pitter and it’s made pitting cherries a breeze! I LOVE this idea! This is so perfect for snacking or tossing in salads and more. Such a good idea! I actually just bought my first batch of not-very-sweet cherries yesterday so I might have to do this to concentrate their sugars! Cherries!!! I love cherries!!! This a great way to have them all year, YUMMO! 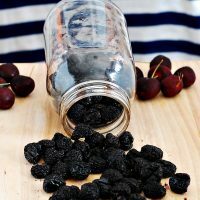 I adore cherries and am looking forward to trying this method. Great inspiration! Thank you Coleen! I adore cherries and only buy small amount that we can eat in a day as they don’t tend to last and I love them at their peak!! This is a great way to keep them longer!!! Wow, I never thought to do this, but now I have to try it. I’m thinking it would be great in my granola and for baking, and maybe even in a duck sauce. I buy dried cherries all the time, I love Costco’s brand of them. But buying cherries while they are on sale and drying them myself?! Score! I am not looking forward to winter either. I hate it! So cool that you dried cherries in your oven! They have been crazy cheap this year, so I have been buying tons too. FABULOUS idea. I buy dried cherries and throw them into so, so much things. I love this and am doing it with my next batch of cherries!!!! What a great way to preserve cherries and save their deliciousness for the seasons to come! Wow … I truly had no idea it was this easy to dry cherries! Thanks so much for sharing … I will definitely be doing this with some cherries before summer’s end! Cherries are my favourite summer fruit! My head is swimming with so many ideas right now–thanks for the awesome tip! I just made 2 pounds of these and they are delicious! Any idea how long they will last once they are dried? I’m thinking about making some more so we have them! From what I’ve read, they should last months in an airtight container at room temp, but I’m keeping mine in the fridge to be safe. Thank you for this. Now I need to get a cherry pitter tool. You have my mind’s wheels turning with uses for these cherries! man, so next year, I’m SO drying my own cherries! we stocked up on their cherry fest sale this year too, although just ate them all straight up – barely made it home with any to speak about! At any rate, we go through bags and bags of dried cherries throughout the year, so this one is in the bag for next year for sure!! 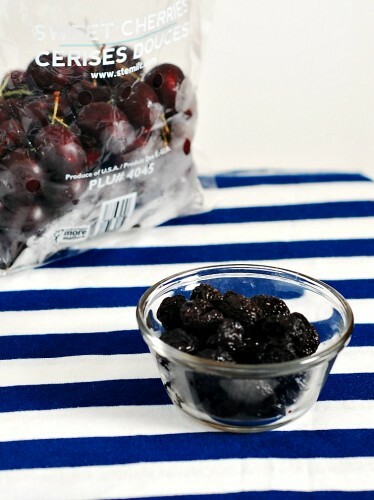 We absolutely love dried cherries. What a great idea to make them yourself!